Here are some great deals for Teacher Appreciation Week. To say thanks to all the great educators, many businesses are offering freebies and deals to celebrate Teacher Appreciation Week. Chipotle - Buy one, get one free burrito from 3 pm to close on Tuesday, May 8, 2018, with faculty ID. 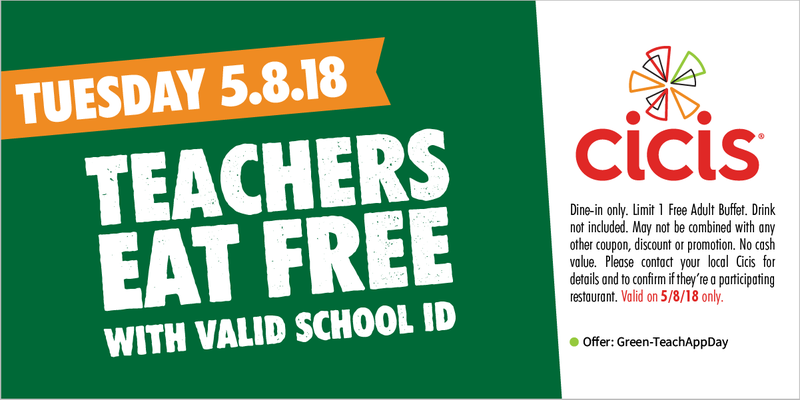 Cicis Pizza - Free pizza buffet on Tuesday, May 8, 2018, with valid school ID at participating locations. Raising Canes - Free box combo on Tuesday, May 8, 2018, from 6-9 pm with current school ID. MOD Pizza - Half off pizza or salad with teacher ID on May 8, 2018. Tacos a Go Go will be offering 20% off to teachers who show their valid ID. Apple - Special education pricing on computers and other products for students and educators. Barnes and Noble - 20-25 percent off publisher's list price on all purchases for classroom use. Banana Republic - 15 percent off full-priced in-store purchases with valid student or teacher ID. J. Crew - 15 percent off online purchases for teachers and students. West Elm- 15 percent off your next purchase when you sign up with an .edu email address.